Though be prepared to invest in some decent walking boots! Reflecting on our recent holiday cottage break away during Easter, I have come to realise how much of the UK we have yet to explore. Activity holidays are definitely a consideration for the future as they enable you to take in your surroundings whilst remaining active, perfect for those who cannot sit still, all whilst being away from the hustle of every day life. Holiday firm Inntravel offer self guided activity holidays for walkers and cyclists throughout Europe, allowing you to take in your surroundings with the detailed guide notes whilst your luggage is transported to your next port of call. These are known as ‘slow holidays’ and I am liking the concept! Allowing you to explore at your own pace, the holiday options are designed for all levels and include: hotel to hotel, centred walking, walking with a guide and family walking. The holidays are designed for individuals and not groups, so there is no need to worry that you may lag behind as you can mooch at your own speed – even choosing not to walk on days you wish to put your feet up! Whilst there are lots of slow walking holidays to choose throughout Europe, whilst the weather is this glorious it is the perfect time to get out and enjoy walking holidays in the UK! What better way to see the UK’s captivating sights than on foot! Stay fit and improve your whole fitness levels, whilst taking your holiday at your pace. Whether on your own, with your family or with a bunch of friends, after spending the day on the move, relax in the comfort of your accommodation at night, without the hassle of having to cook and wash the pots after a lovely day! As an example of the holidays you can expect from Inntravel, the Yorkshire Gastronomic Trail is the perfect choice for foodie loving walkers who would like to try delicious regional cuisine whilst taking in the stunning Yorkshire landscape. The self guided walks allow you to explore Rievaulx Abbey, Helmsley’s crumbling castle, and graceful Nunnington Hall, with the hotel you stay in offering an indoor pool for when you need to relax. Enjoy food-themed visits to a variety of independent producers accompanied by an expert from Yorkshire Food Finder, whilst dining in the award-winning Star at Harome and Pheasant Hotel. The walking holiday concludes in Malton, fondly referred to as the Yorkshire Food Capital and hosts the Malton Food Lovers Festival on the 26th and 27th May. I don’t know about you, but this actually sounds like an ideal break away and walking holidays sound like the perfect break away! Work up and appetite during the day and enjoy glorious food along the way, whilst every detail of your holiday is looked after by the experts at Inntravel. Travel Guide Blog has worked in collaboration with Inntravel on this post. 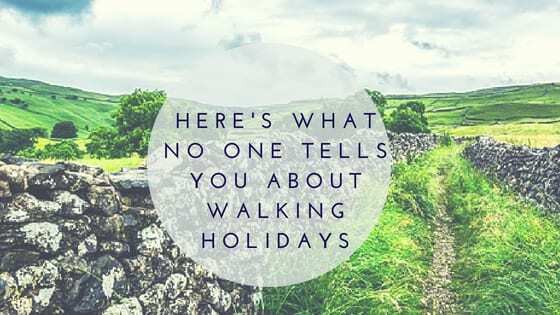 I absolutely love walking holidays – some great tips here! What a lovely way to spend a holiday! O love that you don’t have to keep up with a group and that you can keep your own pace or even decide to take a day off (as I’m sure my homebody family would need). Great tips. Walking holidays aren’t my thing, but for anyone who enjoys them or is thinking of going on one, I’m sure this will be really helpful. Thanks for sharing with #TriumphantTales, we’d love to see you back again on Tuesday!